On Monday, Australian media reported that Islamist battalions operating in the south of the Philippines pledged allegiance to the Islamiс State, possibly ushering in an era of new terror threats on the nation’s doorstep. But Valdai Club expert Alexei Fenenko, associate professor at the Moscow State University School of World Politics, believes the threat is most likely exaggerated. 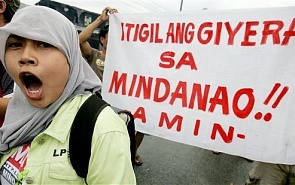 The 2014 peace agreement between the Philippine government and the Moro National Liberation Front stipulating the creation of an autonomous Muslim region in the south of the country caused a breakup among the Islamists, Fenenko told valdaiclub.com. “A bunch of radicals opposing the peace process declared themselves part of the Islamic State to be able to continue fighting the government,” he said. “Just like in Afghanistan, they are not necessarily linked to the actual Islamic State operating in Syria and Iraq,” the scholar added. Still the potential emergence of a new theatre in Southeast Asia is in line with the terrorist group’s interests, Fenenko said. “ISIL is probably in search for a reserve base in case it is defeated in Syria and Iraq and the territory it controls breaks up into several enclaves,” he added. “Several options are probably on the table for them,” Fenenko said. “First, Libya, but this country is too close to NATO’s European member states, which may intervene. Next comes Afghanistan, followed by the Sinai Peninsula in Egypt. And, the fourth, and probably the most convenient, option could be a weak and relatively distant state like the Philippines,” he elaborated. Islamist fighters will continue to be recruited from among the locals, Fenenko believes. Asked if the Philippines could become another Syria attracting radical Islamists from all over the world, he said this scenario was rather unlikely, due to the country’s relative remoteness, but could not be completely ruled out. One thing is clear: the presence of self-proclaimed Islamic State fighters in the Philippines, whether coordinated by the terrorist group leaders or not, will be a powerful factor in the nation’s domestic and foreign policies, Fenenko said. “Some members of the Philippine elite were not happy with the 2014 peace agreement, especially the provision to establish an autonomous Muslim region,” the scholar said. “I would not exclude, therefore, that some of them might want to use this situation to crack down on Bangsamoro, the new autonomous entity,” he added. But most importantly, the situation can change the Philippine government’s political priorities, the scholar said. “If the peace agreement collapses, Manila will have to refocus from the lingering conflict over the South China Sea to its internal problems, and this obviously will play into China’s hands,” he concluded.